ZR 5K Training 2.0 is here! – Zombies, Run! ZR 5K Training 2.0 is here! iPhone users: Weeks 4+ are wrongly locked for existing paid users. A fix will be out very soon! It’s the moment you’ve been waiting for – our first major update to ZR 5K Training in five years! 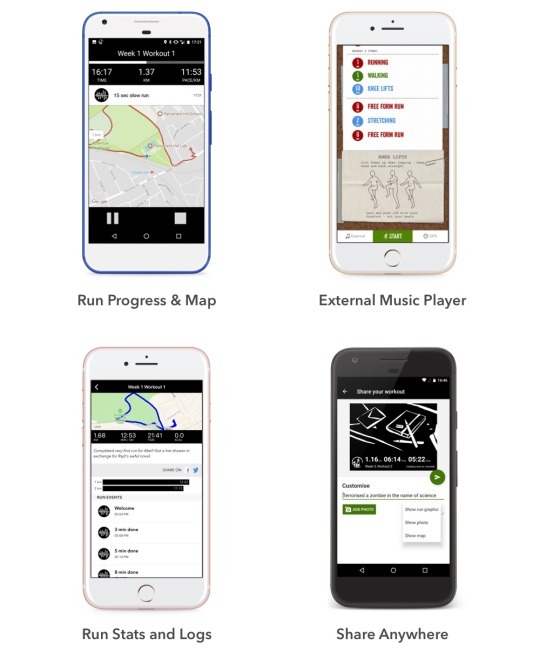 ZR5K is one of our most beloved apps, made specifically for people who are new to running. It combines a professionally-designed couch to 5k training plan with the fantastic, motivating storytelling you love from Zombies, Run! Naturally, this is a free update for all existing users. If you have an iPhone, simply update the app. On Android? Download the new app and update the old app (which you’ll need to keep on your phone as an “unlocker”). Your 5K run progress will sync over from ZombieLink, and we’ll also attempt to sync from existing apps. Wait, there’s more! Zombies, Run! 5K Training is now free to download for everyone! New users get the first three weeks of workouts for free and can unlock the remaining five weeks for a one-time purchase of $3.99 USD – so if there’s someone in your life who wants to start running, this is the app for them! If I’m upgrading on Android, why do I need to keep the old app installed? Short answer: So we can verify you bought the old app and unlock all the workouts in the new (free) app. We’ll soon be updating the old app so it’s much, much smaller and just serves as an unlocker app. This update will also allow us to port over run logs from the old to the new app without ZombieLink. Long answer: On iOS, apps can check to see if a user has a ‘paid receipt’ and then unlock content based on that. You can’t do that on Android! So if we made the old app free, we wouldn’t know whether you’d paid any money for it, which means you’d have to buy the $3.99 unlock like new users do. We think that’s unfair, so we’re going down this route. We’ve talked directly to the Google Play team about problem, and they agree that this solution is the best (or ‘least worst’). My run logs aren’t syncing properly from Classic ZombieLink! We’re working on fixing this right now! I just updated on iPhone and Weeks 4+ are locked – what gives? This is a bug. If you originally paid for the app, our intention is that you don’t have to pay us again. We’ll be releasing a bug fix as soon as we can – within days! If you’re having other problems, please don’t hesitate to contact us at support @ zombiesrungame.com!